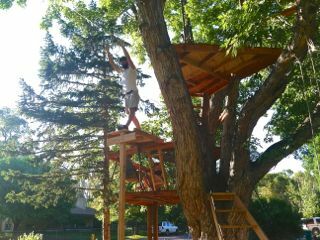 I live in a comfortable neighborhood surrounded by tree houses. 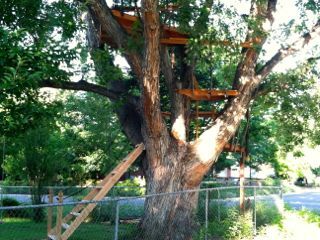 My husband and son built the first tree house on the block, a German-style cottage, high above our front yard. Two neighbors followed suit—one included real glass windows, the second, a loft. Recently, down the block, a family moved into a house that sat empty for more than 18 months. We were glad to notice the trimming of shrubs and clearing of overgrown weeds. Then, the hammering throughout the July 4th holiday signaled our neighbors’ plan to join the tree house alliance. What dream are you building? • How would you describe your dream succinctly a la elevator pitch? • What are the necessary steps to develop your dream to fruition? • What would it mean to you to have your dream fulfilled or potentially unfulfilled? If you happen to read my most recent blog, What Would You Be Willing to Sacrifice? you’ll find that I almost gave up one important dream for another. What I’ve learned while building CalmUp® is that creating a dream to me means letting go of expectations and being open to the joy of co-creation. The next time I walked my dogs, our neighbor enthusiastically showed me his new zip line! What does building a dream mean to you? This entry was posted in Enhancing the Quality of Your Day and tagged goals, how to be empowered, productivity. Bookmark the permalink.